From the onset all U. S. stamps could be called definitive issues. Mostly they represented the cost of postage of the day for mail to be delivered from one location to another. In 1869 the issues were called "pictorials" and could be classified as the first commemorative stamps. Other issues containing various denominations, such as the Columbian and the Trans-Mississippi series were considered as commemorative by collectors primarily because they represented a specific theme. The first series of stamps to be defined as definitive could probably be the 1890/1894 issues. These issues contained denominations from 1 cent to 90 cents (and up to the $5 in the 1894 series). These were followed by the 1902 series. 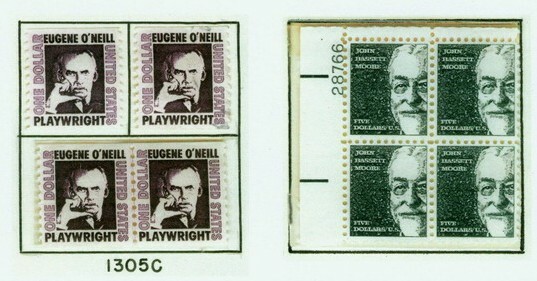 Both series of stamps are sought after by most collectors. My essay today, however, is on the loss of interest of the average collector after this period and the issues of the famous Washington/Franklin series from 1908 through 1919. It is with this set I will begin my adventure concerning the "definitive" or "regular" issue. The Washington/Franklin sets came in many forms, such as different perforations, varying coils (horizontal & vertical), imperforate, and watermarked/un-watermarked. What they all had in common were they were designed to last for an extended period of time. The early series had the denomination spelled out and the one cent stamp had Franklin as the subject. In later issues Washington replaced Franklin on the one cent as seen on the above illustrated 8½ perforated coil. The imperforate issues were limited to the lower denomination issues and many are very difficult to find. These issues were printed with perforations of 10x10, 11x11, and 12x12, however many issues had different perforations as the post office used up sheets of imperforates with varying combinations. Many of these are quite rare. Later issues had Washington on the lower denominations up to the seven cent. Issues had varying watermarks and it was this aspect of these stamps that made them difficult to separate and collect. Notice that the number is not spelled out in the later series. Franklin began at the eight cent issue and continued to the $5. In 1920 the US Postal Service changed the color of the $2 Franklin from orange to red. Although the Washington/Franklin series officially ended in 1919 I’ve included it here. It was the lack of "character" of these stamps which led to a loss of interest by the average collector. Of course the experienced collectors continued to search and buy up these extremely hard to find issues. Some collectors find this series to be the most boring of all definitive stamps to deal with, but for many the amount of research with gauging perforations and checking for watermarks is a time consuming joy. Next in line came the 1922-25 series. This series combined the use of famous Americans along with American landmarks and Americana. This series was un-watermarked. Some issues had printing flaws and are difficult to find. Two additional issues were added later, the 13 cent Harrison and the 17 cent Wilson, to complete the series in 1925. Other issues had overprints over the regular issue but they represented a special reason such as the Molly Pitcher, the Hawaii’s, and the Kansas/Nebraska’s. In 1932 the U.S. Postal Service wanted to start a new series using Washington’s 100th Bicentennial but Congress, due to economic conditions, canceled the higher denomination issues and these stamps became commemorative collectibles. 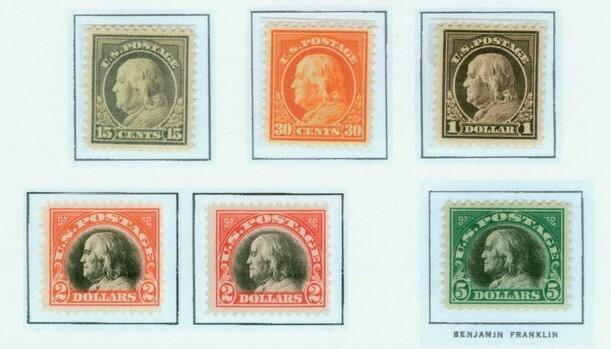 In 1938 the famous "President’s" series was issued. These were very popular issues and millions upon millions were printed. Each stamp had a different president, except the 1½ cent Martha Washington and the 4½ cent White House. All were one color except the $1, $2, and $5, which had black centers. In 1939 several of these issues came out as coils. These were all un-watermarked and easy to collect. World War II came along and new stamps commemorated the war effort primarily and the definitive seemed to be buried in that cause. It would not be until 1954 that the definitive returned. There were many issues during the late 40's and early 50's and it’s sad to say the 1954 definitives just looked like any other stamp. Collecting became finding MNH, cancel, line pairs ( coils ) and Plate Blocks of every issue. The 1965 series arrived and the definitive was just another set of stamps used to fill the void in postage differences. Eventually other definitive issues, including the Americana series, arrived and stamp collectors were overwhelmed with new issues not knowing if it was a definitive or not. They were issued at different dates, even years apart. So to close my little story with the 1965 issues is appropriate and to tell you that those tiny issues that were used to fill postage rate gaps are and always have been an exciting part of postal history and stamp collecting.